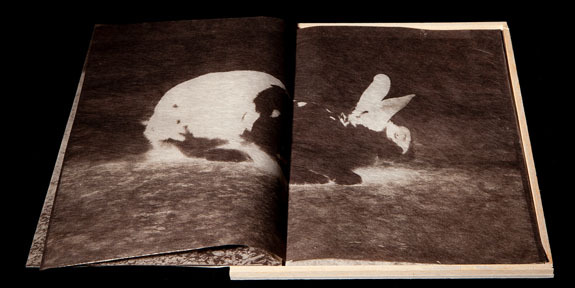 The 1969 moon landing was event of national pride and of progress for mankind, with an emphasis on “man.” In luna, an exhibition of artist’s books and photos, Mexican photographer Patricia Lagarde attempts to recast the significance of the event in more universal terms. Wall text at the beginning of the exhibition traces the evolution of lunar musings back centuries to the Syrian satirist Luciano de Samósata (125-180 A.D), and to other thinkers and writers who long predate the “space race.” Positioning herself in their company, Lagarde effectively upends the notion of the moon shot as a purely masculine, scientific and American endeavor. image on the surface of the moon, telling the small creature: “everyone will remember you; there is your image in light.” In those lines, the fable speaks directly to the nature of photography, while casting the exhibition in terms of fable and cultural mythmaking. 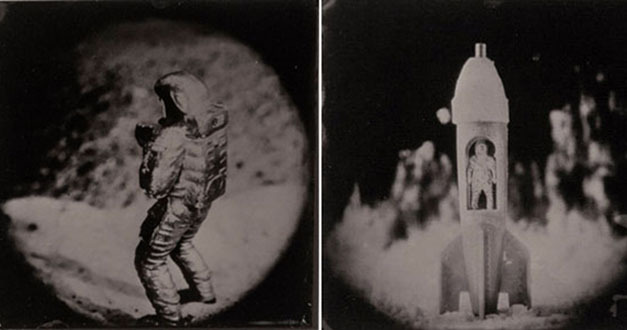 In a grouping of seven tintypes called The Arrival, Lagarde stages a moon landing of her own using model astronauts and a toy rocket ship. While the images carry an eerie, celestial, iridescent quality, the figurines position the piece as a children’s tale. Machinery to See the Moon, a whimsical animation, shows a moon landing executed by the same toy figures seen in the photos. Lagarde creates an audio collage to score the video, splicing together pieces of David Bowie’s Space Oddity, transmissions between Houston and the crew of Apollo 13, and Neil Armstrong’s famous quote uttered upon contact: “That's one small step for man, one giant leap for mankind." The video, while touching, reminds us that the moon landing was also a major media event, one that declared U.S. dominance on a universal scale. 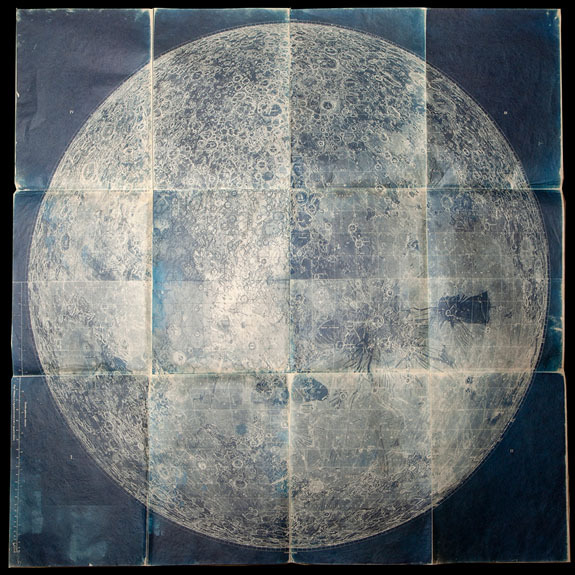 In the seven-piece photomontage, The Evanescent Image, the artist offers an archive of related documents: a photo of a weathered flag of indeterminate nationality; a copy of a speech penned by presidential speechwriter William Safire (to be delivered “in the event of a moon disaster”); and a picture of Armstrong’s boot print on lunar soil, coupled with a quote in which he voices the hope that someone might return to erase it. Through this exhibition, Lagarde has, in a way, granted Armstrong’s wish. Insofar as NASA accidentally erased some of the moon landing footage (a fact Lagarde points out in one piece), the story of the event remains, to certain extent, contested. Lagarde seizes that opportunity to re-frame it as a poetic, deeply felt human need for a universal parable that transcends nationality. In reminding us of the cross-cultural fascination with the moon in storytelling, she reveals the narrative of the Apollo 13 mission as an American nationalist myth, and reclaims some ownership of her own people’s moon myths. In this case, “her own people” are not only those of Mesoamerican lineage, but also artists in general. Lagarde’s astronauts stake the flag of art on the lunar surface. It belongs not to a single nation, but to everyone. Patricia Lagarde: “luna” @ Jack Fischer Gallery (Minnesota Street location) through February 23, 2019. Northern California native Max Blue is a writer of criticism, fiction and poetry. He has studied art history and photography at the San Francisco Art Institute and creative writing at the University of San Francisco. His writing has appeared in Art Practical and Digital America among other publications.